Cats have claws, and they use them to scratch. It's part of being a cat, and it's something that humans who love cats and share their homes with them need to manage. A kitty scratches to shed the dull outer sheathe of the nail to reveal a sharp claw beneath. This is how a wild cat cares for his own nails. Scratching also helps cats mark their territory through activating scent glands that are present in the paws. Scratching relieves feline stress, stretches and exercises the muscles in feline toes, feet, legs, shoulders, and neck, and it just feels great to our feline friends. 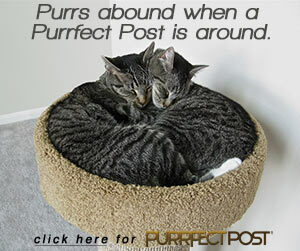 A good scratching post is an essential piece of cat equipment and a necessity for caring for your cat's nails. 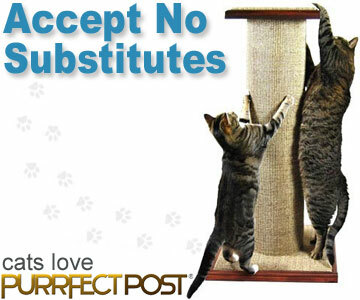 You can learn how to choose the best cat scratching post here: "How to Choose the Best Cat Scratching Post." Trimming your cat's nails regularly will help reduce the damage done if she scratches at some of your belongings instead of her scratching post. It will also decrease the tendency for the nails to become stuck in loops of carpet or on bedding, which can be uncomfortable or painful for your cat. Older cats or those that are sick may develop nails that curl around and grow into the paw pads, so developing a habit of trimming your cat's nails often will keep that from happening. Ideally, handling of paws and nail care should be started when a cat is young. Kittens can easily be trained to allow nail trims if you remember to be gentle and patient. An older cat can learn to tolerate nail trims, as well, but it may take a bit longer. Rushing into a full-scale claw trimming is a foolhardy move unless you're really into operatic drama and traumatic events. As you probably know, cats hate to be restrained. And they don't like you fooling with their paws! After all, cats' claws are a major tool for survival, and your kitty may suspect that your motives for grabbing them aren't good. This is where preparation comes to the rescue. For approximately a week before her pedicure, get your cat accustomed to having her paws handled. You may want to give her treats to reward her for not protesting (or as in the case of my own cat, to distract her from doing so). When your cat allows you to handle her paws without acting upset, gently hold one of them in one hand with your thumb on top of one of the toes and your forefinger on the pad on the bottom. Give treats! Once your cat is fairly calm while you hold her paw this way, practice gently squeezing your thumb and finger together. This will push the claw clear of the fur so it can easily be seen. More treats! Once you can handle your cat's paws and push the nails out without her objecting, you are ready to trim. The point of moving in stages is, of course, to make the process reassuring so that your cat will eventually feel comfortable enough to let you handle her paws without protest. It can be very helpful if someone in the family or perhaps a friend offers to gently cradle a wiggly cat while you are focused on this exercise. Once you've completed the steps above to the point where your cat is comfortable with you pushing her nails out, you're ready to start trimming. Be sure you have a good pair of clippers. Many different types of nail trimmers are available in pet stores. Trimmers like the ones in this picture are good examples. This type of cat nail trimmer also does a great job. Human toenail clippers are easy and effective to use in a very small kitten. Be patient. Don't attempt to trim all of your cat's nails at once the first few times. Trim one or two, reward her with affection or food, and then let her do as she wishes. Cats are not strong on patience or restraint. Don't attempt to change your cat. Instead make it tolerable for her. Eventually, trimming will become a completely accepted experience. The best time to trim your cat's claws is when she is relaxed or sleepy. Never try to do a pedicure right after a stressful experience or an energetic round of play. Gently press the cat's toe pads to reveal sharp claws in need of a trim. When you trim your cat's nails, she should be resting comfortably on your lap, the floor, or a table. Clip about halfway between the end of the quick and the tip of claw. Do not clip the pink quick, or the slightly opaque region that outlines it. This will prevent cutting into areas that would be painful or bleed. The desired effect is simply to blunt the claw tip; remove the hook at the end of the nail. If your cat becomes impatient, take a break, and try again later. Even if you can clip only a claw or two a day, eventually you'll complete the task. Because cats do little damage with their rear claws and do a good job of keeping them trimmed themselves (by chewing them), many cat owners never clip their cats' rear claws. Others trim them every third or fourth nail trimming or have them done by their veterinarian or a professional groomer. How often you need to clip your cat's claws depends somewhat on how much of the tip you remove, as well as how active your cat is, but usually a clipping every fourteen days will suffice. If your cat absolutely refuses to allow you to clip her claws, get assistance from your veterinarian or a professional groomer. If you accidentally clip into the quick, don't panic. The claw may bleed for a bit, but it will usually stop quickly. Soothe your cat by speaking softly to her and stroking her head. Touch a styptic pencil to the claw end or pat on styptic powder to help staunch the bleeding. If you do not have styptic, take a bit of bar soap and press it over the area to cap it. A pinch of cornstarch pushed into the end of the nail will work, too. You can also use a gauze square or even a piece of facial tissue to press on the area. Just count to 60 slowly, release the pressure, and in almost all cases, the bleeding will be done!